Brave, charming, active and powerful…that’s how a Rottweiler is and hence his special dietary needs, which are ably met by Royal Canin’s Rottweiler 31 (Junior) & Rottweiler 26 (Adult). 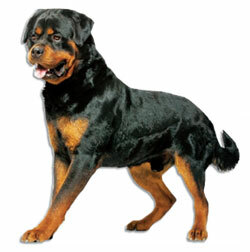 The Rottweiler is one of the oldest breeds. His German origins go back to the time when he was both a guard and herding dog. During the Middle Ages, in the town of Rottweil in the Bade-Wurtemberg region, the Rottweiler was used to look after the flocks and defend livestock sellers against bandits. Since the 20th century, these dogs, whose power and strength make them ideal for work, have been widely used by the police and rescue services. A dog blessed with natural strength. Robust, enduring, calm and quiet but with a strong temperament, the Rottweiler is the king of the guard dogs. By nature, the Rottweiler is a very active, sporty dog who needs lots of exercise. He cannot bear being shut in and has an independent nature. Naturally athletic, his strongly muscled silhouette needs a high level of protein. Nevertheless, without exercise, the Rottweiler can easily gain weight. In order to maintain a constant ideal weight, it is important to monitor his food intake. Whether working or just on a walk with his owners, the Rottweiler is always active and enthusiastic, and puts his joints under strain. Problems such as arthrosis, dysplasia and osteochondrosis can affect the breed. Helping prevent the effects of ageing is important from the onset of adulthood, particularly in large breed dogs, who have a much shorter life expectancy than small ones. Over and above that, it is essential to take good care of the Rottweiler’s cardiac health. The breed can be predisposed to a problem known as a heart murmur. Growing up in 18 months! Growth is an essential phase for the puppy, because this period is responsible for his future health. During the first weeks of life, the puppy benefits from maternally transmitted antibodies, but this protection reduces gradually between the 4th and 12th week of age. As a result, the puppy is very sensitive to the risk of infection, because his own immune system is still immature. However, the right food can help him cross this “immunity gap” by helping reinforce his natural defences. The Rottweiler puppy is a small molossoid… in order to reach his adult size; first of all he has to develop his skeleton, which requires considerable energy, with exactly the right amount of calcium and phosphorus – neither too much nor too little. Muscular development follows next… weight gain slows down considerable while the bone structure solidifies itself. During this period, it is essential that the daily ration is monitored carefully, because if over-fed the puppy will develop fat (adipose cells) rather than muscle. Over 18 months, the Rottweiler puppy increases his birth weight by a factor of 80 to 100! His food during growth must take account of his digestive sensitivity and energy needs. To keep your Rottweiler healthy, Royal Canin offers Rottweiler 31 which provides controlled levels of energy and calcium for optimal growth and the development of the skeleton. Strong, healthy muscles are laid down as a result of the choice of very high quality LIP proteins in combination with L-Carnitine. It also helps the joints develop properly, thanks to increased levels of EPA, DHA, chondroïtine and glucosamine. Besides, prebiotics, psyllium and the use of LIP proteins ensure optimum digestive tolerance. It also helps strengthen the puppy’s natural defences due to a patented synergic complex of antioxidants. The food also helps support this athletic dog’s cardiac functions thanks to beneficial nutrients EPA & DHA, and taurine to encourage good heart contraction, L-Carnitine for the cells’ energy supply, and Vitamins E & C to help maintain vitality. Its special molossoid jaw Kibble is exclusively adapted to the Rottweiler’s jaw, to encourage him to chew. It also takes care of muscle dynamism and joint support. So, if you have a Rottweiler at home, do take care of his special dietary needs.